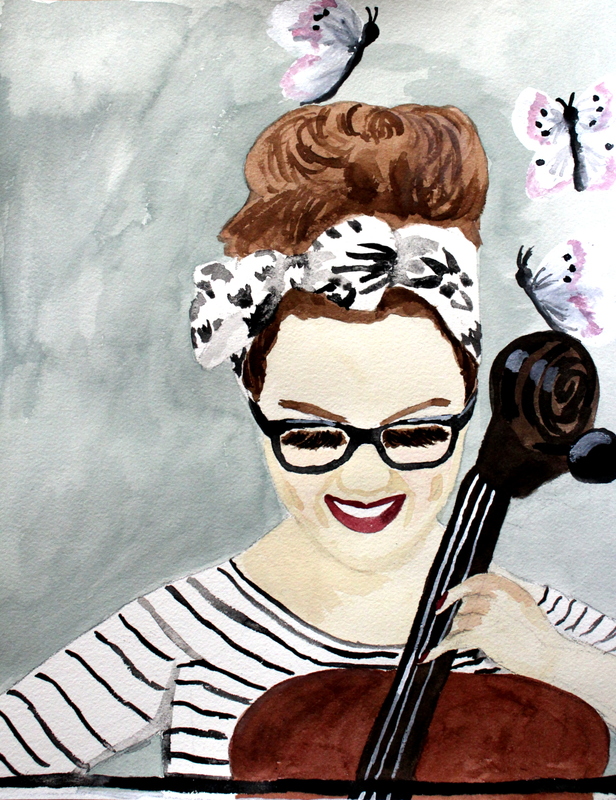 Agatha did not discover her love for the cello until she reached her twenties. She had always been extremely active as a young child and participated in lots of sports; the thought of slowing down to play an instrument never crossed her mind. In college, Agatha’s music theory class took a field trip to a museum, and as part of the experience, the students got to try out lots of different instruments. For some reason, the cello just clicked with Agatha. She had no idea how to play it yet, but it just felt right resting against her body. With the support of her music theory professor, Monsieur Lamb, Agatha found a good cello instructor and started taking lessons in the afternoons after classes. One day when Agatha and her cello instructor, Mr. Kim, were practicing, they decided to go outside to play because it was too warm inside. By this time, Agatha was quite proficient and could play lovely songs on the cello. As she played, butterflies started to swirl around her – first one, then two, and by the time she finished, there were about 20. Mr. Kim had never seen anything like it. The next day, they came back to the field to play, and the same thing happened. Out of curiosity, Mr. Kim played his cello to see if the butterflies would gravitate toward him, but they just fluttered away. From then on, he referred to Agatha as the butterfly charmer. Whenever she performed outside, day or night, butterflies appeared and fluttered lazily about enchanting everyone present. Agatha loved this spectacle because she had always been fascinated by butterflies. It always made her happy to see that the butterflies enjoyed her music, and she kept them in mind when she started to compose music.